My partner is the lovely Lorelai from Life With Lorelai. When it comes to decorating her tree, Lorelai is a lot like me. She says: “…. my tree has everything on it …. I love all the special stories and memories that go with my holiday decorations.” Me too! Opening up each box and bin takes me on a walk down memory lane every year. I love that. 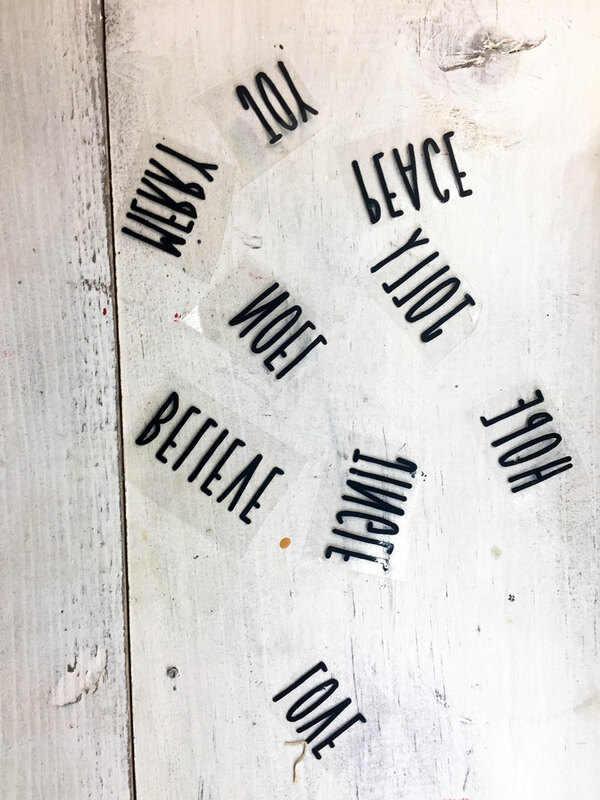 Open up Cricut Design Space or Silhouette Studio and create your designs (which are the words that will go on the ornaments). The font I used is The Skinny. 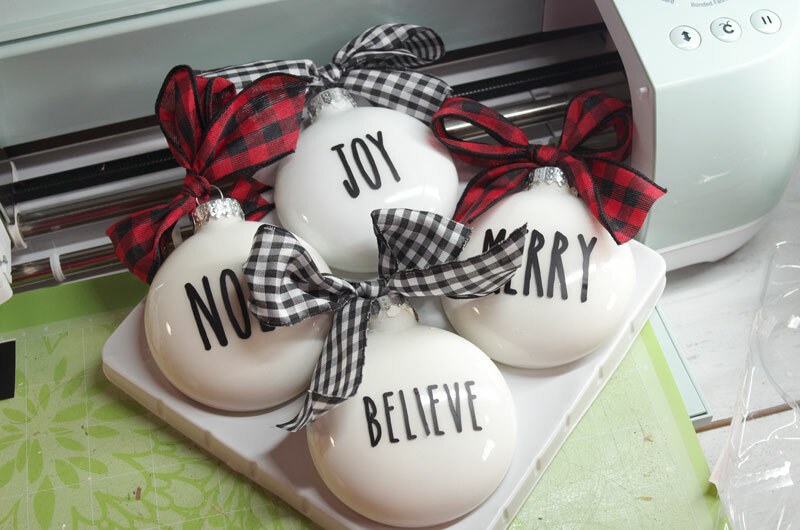 Resize the words as needed to fit on your ornaments. I also decreased the space between the letters. Cut the words out of black vinyl and weed away the excess vinyl with the weeding hook. Use the transfer paper to remove the vinyl design from the backing. 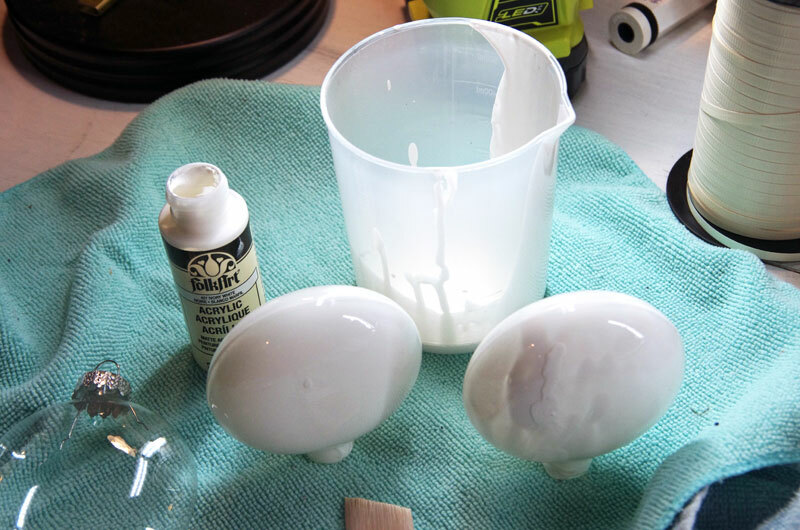 Dilute white acrylic craft paint with water (70/30) and pour into ornaments, swirl, then drain. Repeat two more times. Allow each coat to dry approximately 30 min. Pour a small amount of the polycrylic into each ornament. Swirl, drain, and allow to dry overnight. 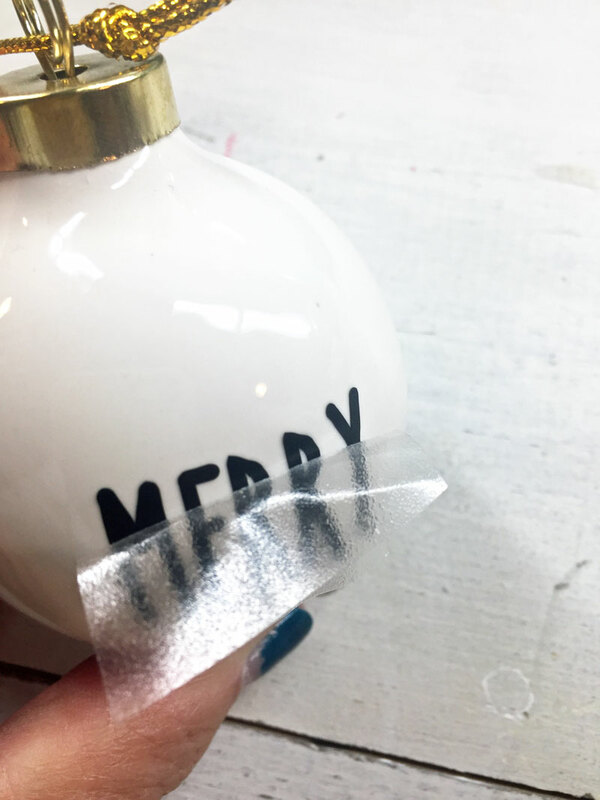 Apply the vinyl design to each ornament. 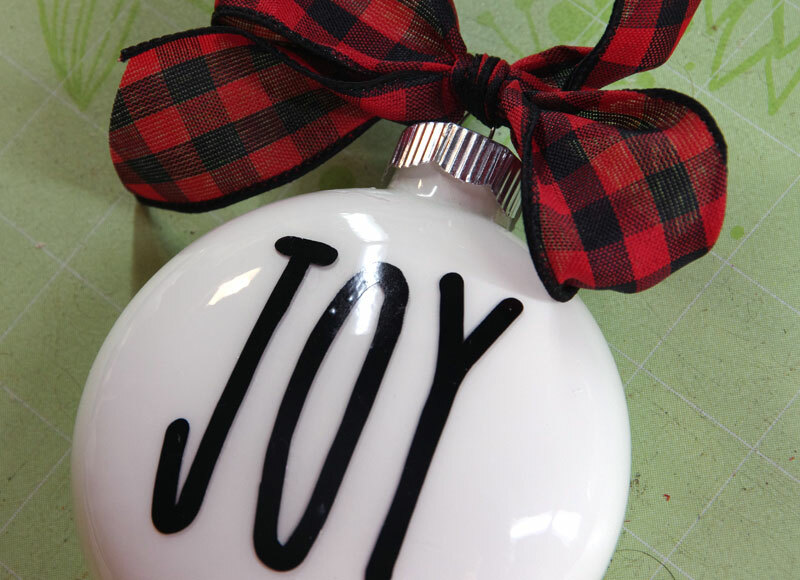 Remove the transfer paper and make sure each letter is pressed firmly onto the ornament. Start in the middle and work your way out to the ends. Add a ribbon bow or twine. So pretty Jeanie! 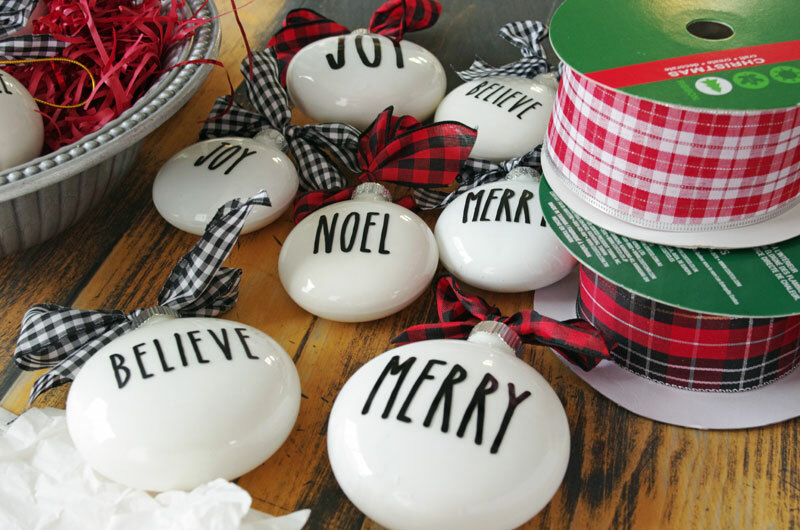 I have never seen Rea Dunn here in Canada, but these ornaments are a fun diy way to get in on the trend! Oh this makes us wish we had a machine! These ornaments are super cute and creative! Love how they turned out! These are so lovely and go with any type of decorating style. They turned out lovely! I’m sure Lorelai will love them. I love the Rae Dunn look and these turned out fantastic!! What a clever idea! These ornaments have such a simple, clean, yet elegant look! Thanks for sharing this DYI ! I love these! I’m not a Rae Dunn collector, but I do like the simplicity of her designs. Thanks so much for sharing your turtorial and I’m going to try it. Hi, I would love to know where I can purchase the Round, almost flat ornaments that you used for this great project – would you have an affiliate link that I could use? Great idea! These could be used in any kind of decor! I love seeing what everyone came up with and how creative they are! I love the simple beauty of your ornaments! They have such a classic look & are perfect for any tree! I think I am getting a Cricut for Christmas and I can’t wait after seeing how to make cool stuff like this! !